The silence on aviation emissions is deafening. And our politicians are some of the worst at exacerbating aviation emissions and climate impact from aviation. Take Liberal Party Finance Minister Mathias Cormann for example. His flight to Perth in June last year using a VIP jet for the forward journey contributed 9428 kg of CO₂e climate impact. A return commercial flight business class amounts to 2355 kg of CO₂e climate impact. The excess climate impact (and this is a very conservative figure) was 7073 kg of CO₂e climate impact. This flight journey by Mathias Cormann was a rort at taxpayers expense and the expense of future generations through it's climate impact. Last year (2018) on June 22 he booked an RAAF VIP jet to fly from Canberra to Adelaide, then on to Perth. The jet returned to Canberra without any passengers. Cormann returned on a commercial flight 2 days later. The VIP CL604 Challenger defence jet is operated by No. 34 Squadron with a pilot, co-pilot and attendant. According to the ABC News report, flying the plane to Perth via Adelaide attract an estimated cost of $37,000 in fuel, landing fees, and airport handling charges, a cost 20 times the price of a commercial ticket to Perth. But this underestimates the full costs, and does not factor in leasing the aircraft and maintaining the aircraft. For the larger Boeing 737 BBJ VIP jets the ABC Factcheck Unit calculated that the VIP cost would be much higher. Adding up the costs of fuel and landing fees, leasing the aircraft and maintaining the aircraft, an average 8.25-hour return flight from Canberra to Perth would cost $140,483. The Challenger aircraft would probably be much cheaper than this. I wonder if $80,000 would be a ballpark total cost estimate? Cormann justified the use of the flight arguing that No commercial flights were available to meet his parliamentary business requirements, which was to have face to face meetings in Adelaide with Cross-bench Senators to try and secure their votes for the Government's corporate tax rate reduction. While the meetings took place there are questions over there urgency or need that would require requisition of a VIP flight. Cormann did meet with Centre Alliance senators Stirling Griff and Rex Patrick in Adelaide. Senator Stirling Griff highlighted that while there was benefit in having a face to face meeting, he did not see any urgency in having the meeting when they would see each other 3 days later back in Canberra..
"It wasn't a meeting we instigated, it was a meeting that the Minister wanted to have with us to just discuss upcoming legislation. Look, it could have happened that day, it could have happened the next day, it could have happened three or four days later. I don't believe at the time there was a critical need for a meeting on that day." he told the ABC. The Defence Minister or Prime Minister approves all applications to use VIP aircraft under ministerial guidelines that were tightened after the Bronwyn Bishop "Choppergate" affair. Minister for Defence Christopher Pyne, told the ABC News, "when considering the use of [Special Purpose Aircraft] to enable ministers to adequately perform their duties, consideration is given to the availability and suitability of commercial travel". "In circumstances where commercial alternatives are readily available, the most efficient means of transport will be utilised and the [Special Purpose Aircraft] may not be used," a spokesman for Pyne said. It is in the power of the minister for defence to "not approve a use of special purpose aircraft that would not provide value for money in the circumstances, taking into account the need to conduct the relevant member's parliamentary business". The VIP flight was the only flight in the first half of 2018 with a single passenger. So Cormann's flight came at enormous cost to taxpayers, somewhere far in excess of $37,000, once you factor in costs of maintenance and leasing. 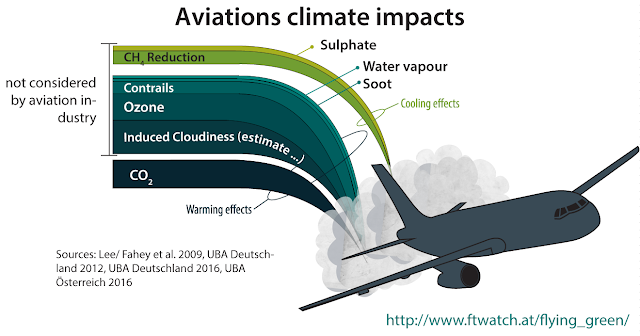 But it also generated at minimum 5895 kg CO₂e, or nearly 6 tonnes, of aviation climate impact, above and beyond a normal commercial business class flight. For far too long transport emissions have been ignored by the Federal Government. Nominally domestic aviation emissions are regulated by the Federal Government. While there is some monitoring of aircraft efficiency improvements and flight route optimisation, these hardly compensate for the growth in domestic aviation and aviation emissions. The Federal Government has no plan to constrain or reduce domestic aviation emissions. So I sat down and tried to get some rough figures on the excess carbon emissions of Mathias Cormann's return flight to Perth via the Adelaide stopover. This is by necessity a very rough calculation. Use of special VIP charter flights are not exactly accurately accounted for in aviation emissions calculators. It is a gross under-estimation of the total climate impact of the VIP flight for one passenger. But it provides a baseline of the excess emissions directly attributable to this ministerial rorting of a VIP flight. I used the Atmosfair flight emissions calculator as this includes a component for CO2 aviation climate impact. This is important as CO2 emissions make up globally about 2 per cent of global CO2 emissions, while it is estimated that aviation causes about 5 per cent of the global warming impact. The difference is multiple factors in chemical interactions at altitude and cloud formation that is not accounted for by adding up just the CO2 emissions. Corman's VIP flight had three crew and one passenger to Perth, via Adelaide. The plane returned to Canberra just with the 3 crew. I put these flights into the calculator as a charter flight, business class. I included 4 people in the VIP flight via Adelaide stopover from Canberra to Perth. Separate entries for the return VIP flight with 3 crew, and the commercial flight Cormann took back to Canberra. Totalled up these emissions. I then calculated a Business class return commercial flight and subtracted Cormann's journey and use of the VIP plane to find the emissions gap. 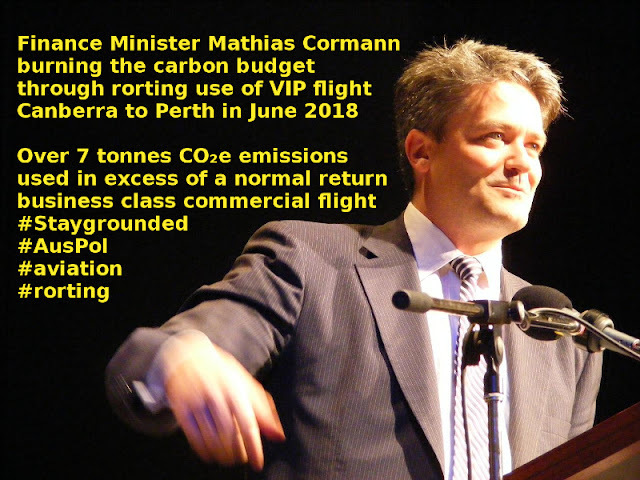 A minimum attributable excess of 7,000kg of CO2e by Cormann using the VIP flight. 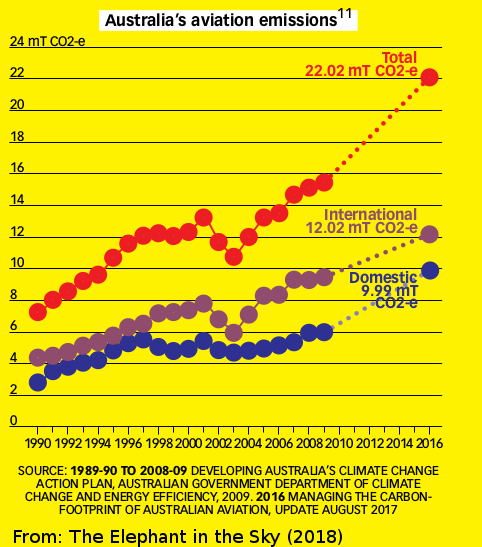 So this is the excess emissions and climate impact that, at the very minimum, Mathias Cormon caused to be used in undertaking that return Canberra-Perth flight journey using the defence forces VIP jet for the forward journey, rather than a commercial flight.